As promised, here is the recap of Day 2, of the PRSA Digital Impact Conference in NY this week. I was invited to cover the 2 day conference, and was happy to join the discussion with all the bright and interesting professionals that it brought together. Unfortunately, I missed Jennifer Preston’s talk but fortunately for you, Eric Schwartzman has you covered. You can watch the whole talk here. I heard it was really good. 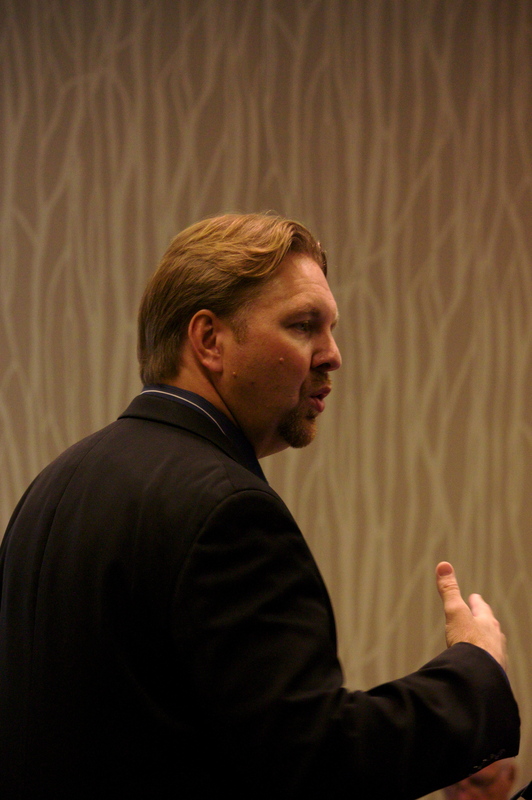 The first speaker I caught on Day 2 was Carlos Dominguez. He said that people don’t want to change, which makes it hard to change a process within a company. It usually isn’t the system that’s the problem, it’s the people in it. Once they become comfortable with a system, they don’t want to change it. He went over a lot of the stuff you hear all the time. Know your goals and objectives. Measure…etc. He mentioned that Cisco does a lot of reverse mentoring with their employees. They host meetings and create an environment where the younger (Gen-Y) employees mentor the older employees on how to use the new tools. You guys know where I stand on that one. Reverse mentoring is great, and needed…but to assume that a young professional is more knowledgeable on how to use social tools for business than an older professional, is a mistake. Gen-Yers grew up using these tools recreationally. It’s very different than how businesses approach it. Carlos also said, “Video is going to be the killer application”. I think it already is. Either way, he’s right, and he spoke a lot about how cisco is embracing video. 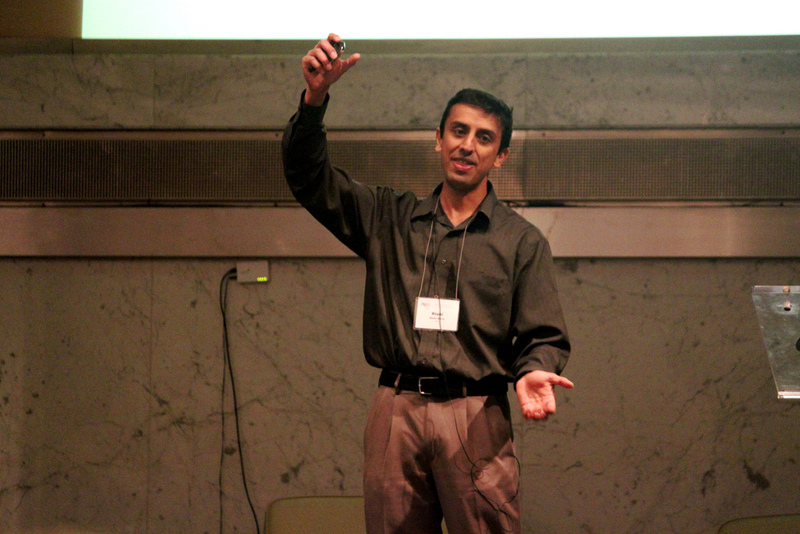 Next, I listened to Rishi Dave (Dell) speak. "Forget the numbers. The impact of SM is this big"
You can gather the best viewpoints in that space, and organize it for potential and current customers to consume. To be honest, I was pretty disappointed with this talk. I really don’t have points to share with you because he didn’t say much. He had great content, with a timeline of videos and images from the crisis they faced when Michael Jackson passed away, and mobs formed around the hospital. In the end, it just sounded like they were in a tough situation, and had no idea what to do. The talk was supposed to use this situation as a learning experience, and show us how we can apply UCLA’s insights to developing a social media program that’s nimble and ready for anything. It really didn’t. Or maybe I’m just a bad listener. Finally, I truly enjoyed a panel about “Where is PR headed?” with Kami Huyse, Clay Hebert and Jonathan Kopp. The responses were a bit scattered so I’ll try to just list out a few key points from the panel as a whole. Augmented reality is going to be huge. Location is also going to be huge. Social media overload is only getting worse. Mobile will continue to grow and will probably be the most important platform for business. Overall I really enjoyed this conference. The speakers were pretty insightful and the crowd seemed to genuinely find value in the content. Everything ran on time, the people were great, the food was awesome, the Day 1 networking after party was done really well and the location got the job done. 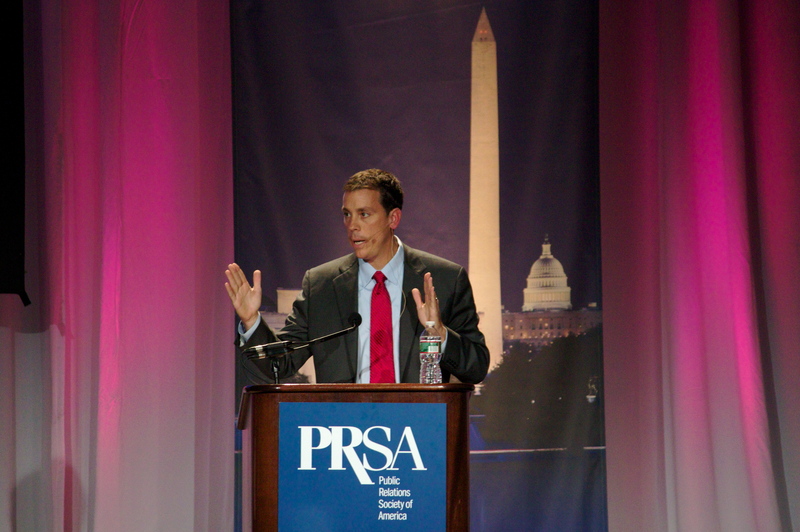 I’d like to thank the fine folks of PRSA for inviting me to cover the conference. You can find all of the photos from this event here. You can find the Day 1 recap of this event here. 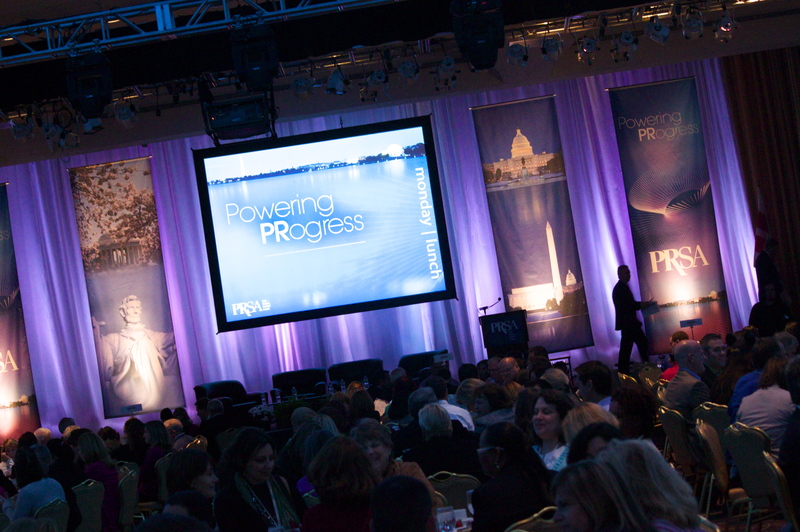 I was invited to attend and cover the PRSA Digital Impact Conference in NY this week. It was packed with PR professionals and business owners looking to wrap their heads around the digital innovations that have warped the traditional field of PR in the past year. The speakers that I listened to provided content that ranged from beginner level basics, to a sort of “mid-level” understanding of the social space. Jeremiah Owyang kicked it off. This is a movement, get your company ready. He was as helpful as always, and set the conference off right, as many speakers that followed him referred back to his talk. I loved his idea in “Love yourself first then love your customers – get your company ready for social engagement”. If you and your employees aren’t proud of your company, how can you expect your customers to be? Next came Paul Gillen and Dave Balter, two guys who really know how to work a crowd. They were witty, to the point, and actually pretty damn insightful. Paul went first, sharing his thoughts on the term “ambassador”. He explained, “An ambassador can be a friend, a relative, a blogger…” making the point that really, anyone can be an ambassador for you or your brand. Start by looking around you at the people you’re close with. Paul also made the point that you don’t have to pay someone to be an ambassador. In fact, it’s probably best you don’t. Dave then drove that point home with an example that I loved. He asked, “If you were my good friend, and I offered you 5 dollars to come help me move my couch, would you help me?” A few hands went up. Then he asked, “Now what if I made this awesome pizza with all this good stuff on it, and asked you to come over to help me move my couch, while we hang out and eat pizza?”. Almost all the hands went up. (probably some veggies in the crowd). It really nailed a huge concept in social media. People don’t want to be bribed or manipulated into doing something. Give them something they can appreciate, act like a person, and they’ll be happy to help out. If you get one person to share content in the best places possible, that’s better than 50,000. Influence is a “topic state”. You can be influential in coffee, and not influential in sneakers. Seek out ordinary influencers, not just the “influentials”. Next I sat down to watch Heidi Sullivan and Shashi Bellamkomda speak about crisis management on the social web. Be active and be present so that when a crisis hits, you’re there, and you’re ready. Try to spot a “crisis” situation early. If you see several tweets come in at once about a particular issue, look into it immediately. It can spread like wild fire on the social web. Respond to every single complaint. If there are too many complaints, you’re probably facing a crisis. Put up an official statement that will answer a lot of questions, and make sure that it’s clear for your customers. You can manage your online reputation, with offline events. And now we arrive at the second keynote with Google’s communication manager, Gabriel Stricker. The talk didn’t really give you much actionable content, but it really did give you a lot to chew on. He touched on the concept of crisis management as well, acting as a good follow up to the previous panel. Using a blog post from Jet Blue as an example, he explained how effective it can be, in a crisis situation, to just get out a message that speaks to your customers on their level. Don’t put out an over-worked, dry press release. Speak like a human, because humans are the ones that you have to convince. Stricker also spoke about Google’s “launch and iterate” process of doing things. It’s how they launch their products, and also how they approach their communications projects. Everything doesn’t have to be perfect when you launch it. It’s better to get something out there, and rework it based on customer feedback and testing. 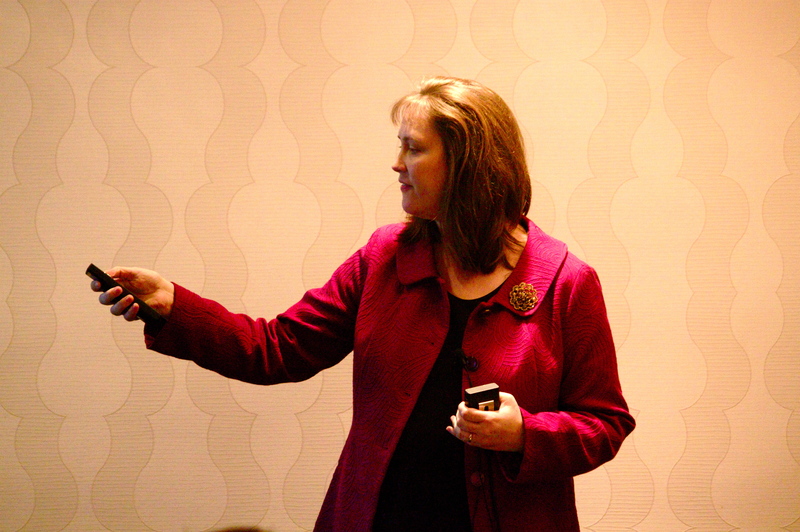 Next I watched Deborah Schultz (Altimeter group) speak. Like the tagline on her blog says: “Technology changes, people don’t”. Be present consistently, and be genuine. Don’t “ignore ignore ignore” and then reach out when you need something. To build a connected, and strong community, you have to create an “ongoing experience”. 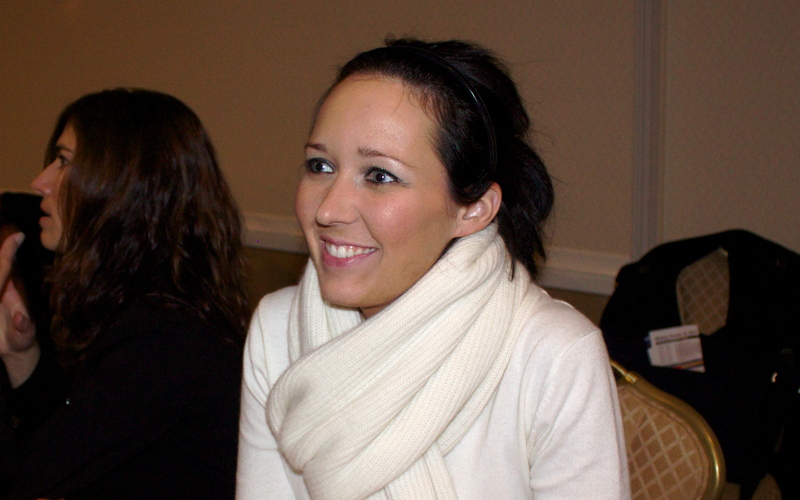 She rocked out for an hour on the topic of “Building a Social Media Strategy”. Certainly a tough topic to cover thoroughly in an hour…or at all. I won’t get into the whole strategy that she lays out. You can find her slides online. I did want to touch on one aspect of her talk and that’s research. She put A LOT of emphasis on doing research before hand, and I couldn’t agree more. The term “social media SWOT analysis” is something that anyone looking to get involved on social platforms should get to know well. Understanding the environment internally and externally will really help you understand what you need to do. Do research before you start a facebook fan page “just because”. You can check out all the pictures from the event here. Stay tuned for the Day 2 recap. The first ever LIVE #journchat event has now been completed. It proved to be extremely interesting and left me with a lot of lessons learned about the future of organized events and discussions. The idea behind these live events is compelling: Drive a conversation that integrates the face-to-face with the social web. It’s a tough feat to accomplish, and definitely one that will take a few times to get right. The Philly event brought in some of Philly’s best and brightest, although the numbers were certainly much less than that of other locations like Chicago. Essentially, we were able to form one smaller group of highly insightful and active individuals, including journalists, bloggers, PR and social media professionals, that drove a lively discussion. When online, if a question comes up that doesn’t apply to you, it’s easy to just do something else for 10 minutes until the next question comes up. During a live discussion, you’re only focus is the discussions, and so if you don’t relate, you can’t participate. It may be better to keep the questions very general. When a conversation online takes a life of it’s own, that’s okay, because everyone is looking at the same conversation. In the live event, every group is going to approach the discussion a little bit differently. This causes a disconnect between the online conversation and the offline. More collaboration is needed between the “Champions” and the Moderator (Sarah Evans) throughout the chat. It proved to be difficult to remain in contact and discuss issues, questions, or suggestions. I think that Sarah is better off letting someone else champion her location’s event and she should just focus on working with all the champions, and choosing questions. At our location, there were only a couple laptops. I think this is better. I tweeted out good points, comments, and questions that came up, and others used their phones if they had something specific to tweet. The interesting part here, is that for the most part, the live events won’t take part in the conversation online. They’ll watch the live feed (we had it on a projector screen) and take the conversation live. Is it possible to have a live discussion while also effectively taking part in the conversation online? I’m not sure it is. Do you think it’s possible to have these kind of offline discussions closely integrated and kept consistent with online conversations? Share your thoughts, whether you were at the event, or not. You can check out the recap of the entire #journchat LIVE event at Sarah’s blog here. On August 17th (one week from the day of this post) at 7:30est, SIX cities will be hosting a live event during the chat where participants will be able to join the conversation IN PERSON as well as online. The cities are: Detroit, Pittsburgh, Philadelphia, Phoenix, Minneapolis and Chicago. You can find links to all the different events here. You can find more info and sign up for the Philly Journchat event HERE. All are welcome. SPOTS ARE LIMITED! Not good enough? Well Rustica Philly is totally awesome, and is providing pizza for the event! If you’re still not excited, it’s probably because you haven’t had Rustica pizza before. Also, all professionals are invited for a pre-event to sit down with the start-up teams of DreamIt Ventures to learn about their entrpreneurial projects and shoot them some advice on your specialties. If you’d like to attend the pre-event to sit with a start-up team, you have any questions or you’re interested in providing any SWAG from your brand or interested in sponsoring the event, email me at DSpinks5 at gmail dot com. Hope to see you all there and get ready for an awesome discussion!